Running evangelist Mara Yamauchi has an interesting position in the history books. 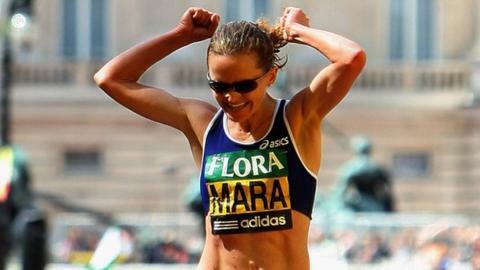 She is the second-fastest British woman - after world record holder Paula Radcliffe - to run a marathon. Other notable Yamauchi feats include sixth place at the 2008 Beijing Olympic and second in the 2009 London Marathon. The gifted Oxford-born runner retired from the professional circuit in 2012 and is now devoting her energies to helping others get the best out of themselves - especially when it comes to convincing novices of the "valuable contribution that running can make to our lives". Honestly, the sheer enjoyment of running on a sunny day - especially surrounded by nature, a nice view and fresh air - is out of this world. But in any weather, you always feel better after a run than before you set out. Compared to almost any other sport - tennis, rowing, football, horse-riding - running really does not cost much. A pair of trainers and some kit is all you need. There are plenty of gadgets for those who want them, but they aren't essential - running can be done with very little equipment. Running with others is really sociable and great fun. It can also ease the pain of hard training! By tackling the challenges of running together, you will become comrades in arms, not just plain old friends. Running with a friend can be more fun than just sitting and talking. Many people say running is their best thinking time. Running somehow clears your mind of distraction, and allows you to see things clearly. When I run, ideas pop into my head so quickly I have to write them down when I get home before I forget them. It can provide creative space. Humans are hunter-gatherers - we were born to run long distances. Ultimately, running is about getting from one place to another with minimal fuss. Few of us make use of this nowadays, but why not start up? You can run to get to the shops, to a local park, to a friend's house, to work. By running, we are going back to our evolutionary roots - back to what being human is all about. Children run spontaneously as soon as they are able to. It's the simplest, purest form of exercise in existence - the most basic, fundamental movement we know. There are no complications. Just an open road, a start and a finish. That open road, and the sense of freedom that comes with choosing where you want to go, can be liberating and exhilarating. Our 21st century modern world has spawned an explosion of lifestyle diseases such as diabetes, cancer and heart disease - many of which are exacerbated by obesity and being overweight. Running, safely, is one of the best forms of exercise for managing weight as it does burn calories. Whenever I travel or go on holiday, I love getting to know my destination through running, usually early in the mornings when things are quiet. You can cover more ground than walking, you see things in a different light and find places you may not see on a typical sight-seeing route. Running helps to get rid of excessive adrenalin and other stress hormones. It can really help with staying calm, relaxed and keeping things in perspective. It can also free your mind from daily worries and problems. It teaches us a glut of lessons that we can draw upon: that hard work pays off; how to set a goal and work towards it; that we can realise our dreams if we put our minds to it; that you have to commit to something to do it well; and that we can inspire others by challenging ourselves.